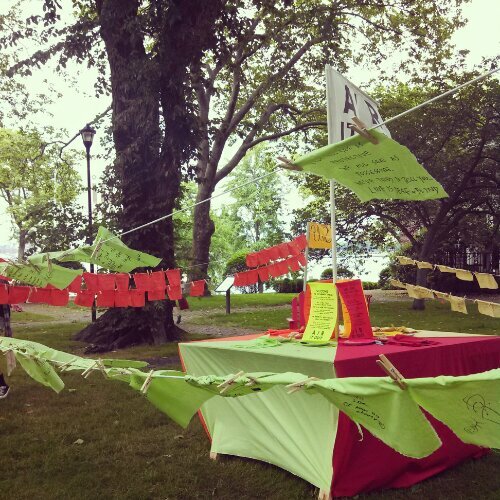 Recently I went to FIGMENT NYC on Governor’s Island. I guess you’d call it an interactive art festival as there are installations to explore and to partake in. 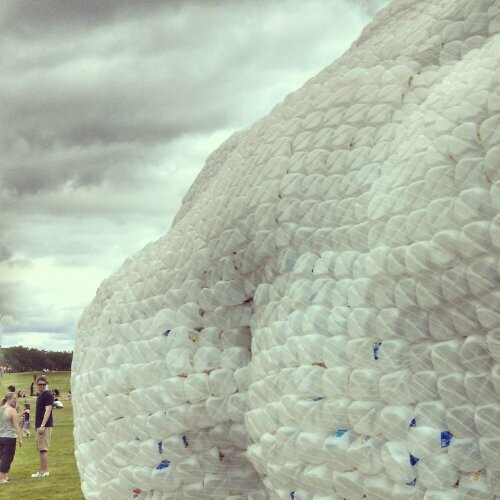 A favorite seemed to be Head in the Clouds which was built from empty water bottles and gallon jugs. There was a DJ playing inside and so people were dancing in what was rapidly becoming a mud pit. 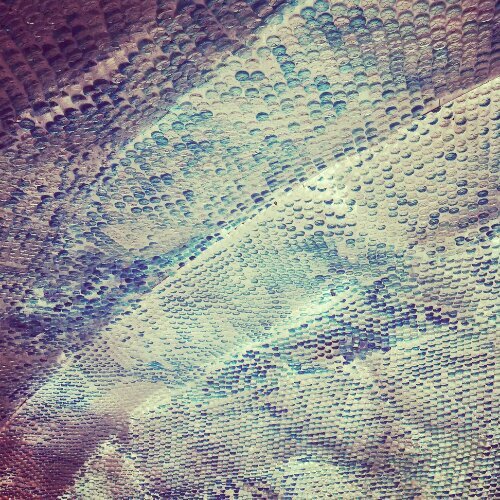 The cloud would catch the light of the sun or lack thereof so in itself the art interacted with nature. I was enthralled. There was the Costume Den where you could take any costume you wanted and wear it for the day or even home. 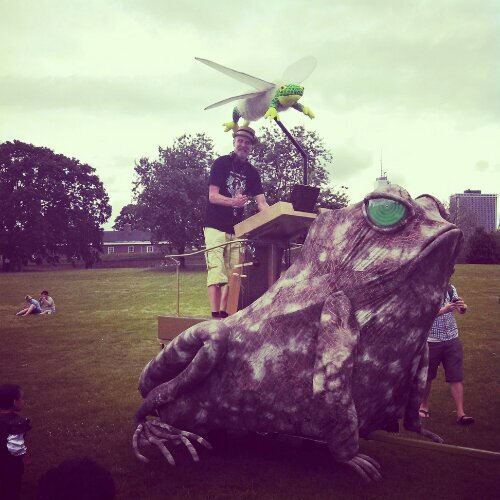 Outside a DJ spun atop a giant toad-mobile. There were painting installations like the one where you loaded up a remote controlled car with paint and drove it around the canvas or the letter stamp wall or when I was encouraged to decorate swathes of fabric wrapped around trees. I had someone draw an outline of me hugging a tree. There was an open mic. Quite literally. If you had anything you wanted to say, read, sing you just walked up to the mic. A group of guys seemed to improvise an a capella band. There was the dinner table at which you could write a message about yourself, a lover, friends or life and attach it to a clothes line. Air it out. Anonymously. There was the big rope of fabric seemingly abandoned in the middle of the lawn that everyone moved around and created shapes with from spirals to a massive jump rope. There was a mini golf built from industrial waste (computers, metal parts etc) and a tree house and then there was the dance party on a section of grass with the DJ was perched atop the roof of a school bus and below people danced, juggled or hula hooped to the beat. 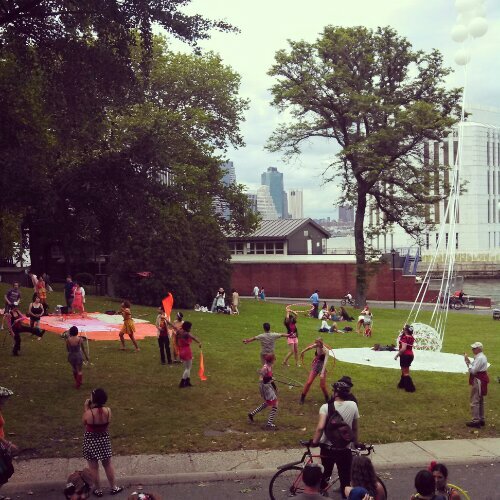 Overall FIGMENT NYC embodied the spirit of child like fun. A return to that state of mind when the most mundane inanimate object could be made a toy or when you just dance because someone is playing music or its in your head. That sounds like a fabulous event. Have to love being able to let go and just have fun for a day.